The characteristic dots and simple linear structures of batik-making, that dominated the surface in emily’s first few years of painting on canvas, gave way to large fields of dots throughout 1992-93. Dots floated, freely filling large canvases and veiling traceries of lines that are fully or partially obscured below the surface. Dots are an integral stylistic element in Emily’s work. This universal human mark is a generic feature of all desert art, originating in ritual body painting and ground designs. Dots have become such an identifiable hallmark of contemporary desert art that works from the region is often simply referred to as ‘dot painting’. 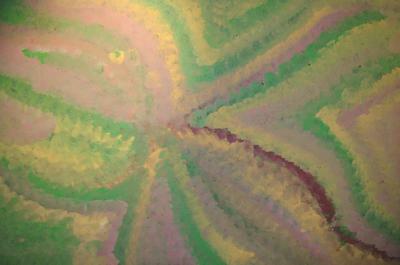 Whilst her work has influenced many of her contemporaries, few desert artists, either men or women, have used the dot mark as innovatively as Emily. Her dots range from fine to coarse, controlled to radical, and they sometimes appear as single dots while at other times as double or triple dots. Large dots in some works join to form lines that move, evoking the rhythem of dancing, the dynamism of growth, and the life force of nature as wind-borne seeds that scatter across the land. The changing seasons and night skies are sensed in the expansive an shifting tonalities of emily’s palette. Emily Kame Kngwarreye is without a doubt the most famous female Aboriginal artist to date. She may be considered one of the greatest contemporary Australian artists and her influence on the world of both indigenous and non-indigenous Australian art is indisputably great. 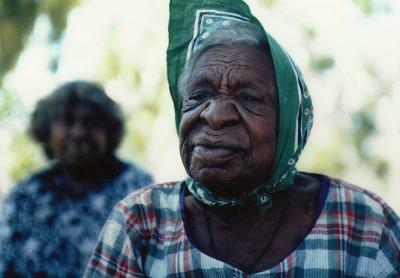 Emily was born around 1910 in Utopia, a community in the Central Desert, around 230 kilometres north east of Alice Sp . . .